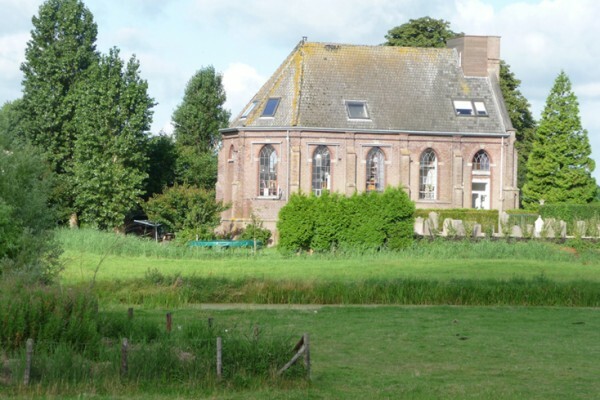 Surrounded by the beautiful countryside of North Holland, the former Dutch Reformed church of Etersheim is located next to the Marker lake. In this historical heritage, now the possibility has been created to stay overnight. 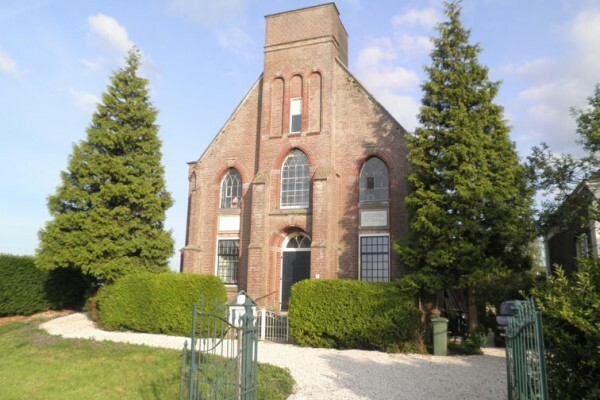 High up in the church, a spacious room with attached private bathroom is available for Bed & Breakfast. 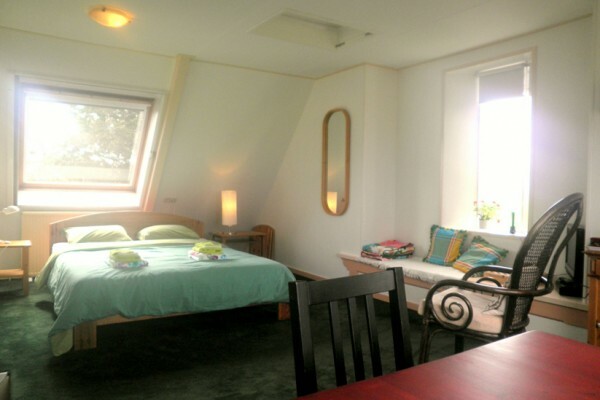 It offers a breathtaking view over the Marker Lake and the surrounding North Holland scenery. The church is located in a very old little town: Etersheim, next to the Marker Lake. This is right in between historic towns Hoorn en Edam-Volendam. World herritage polder De Beemster is close by. Amsterdam and open air museums Zuiderzeemusuem and Zaanse Schans are just a 30 minutes drive by car. The church stands directly on the popular Zuiderzee route. In addition to this continuous route around the IJsselmeer (IJssel lake), it is also in the middle of several smaller walking and cycling routes through the Dutch agricultural landscape, with cows and sheep, dikes, canals and lovely villages. Next to the church stands a historic museum mill, with visitors center and cafe, "De Breek", and an old museum school. 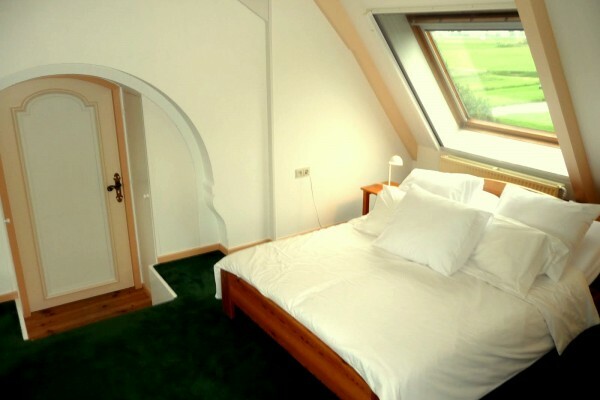 On the top floor of the building, the spacious room is situated, with an adjoining bathroom with shower. The room is very light and has large windows overlooking the Marker Lake. It is suited for 1-3 adults, or for a family consisting maximally of 2 adults and 2 children. The room is furnished with a double bed with adjustable bed frames and possibly one or two extra beds. A dining table stands directly underneath the window that offers the nicest view. Also a crib and changing table are available. A television and a computer with internet acces are present in the room, and the bathroom contains a shower cabin, toilet and sink. Enjoy breakfast privately in your room or even in bed. In the room it is possible to make coffee and tea etc. yourselves, a microwave and refrigerator is also present. On request it may be possible that diner is served. Good to know: The room is only accessible by stairs, and also includes some steps itself. There is a sweet Golden Retriever dog and cat in the house, obviously not in the vicinity of the guestroom. A full breakfast is being served up in the room, or in bed, down in the living room or in the garden. There are two bicicles to borrow for guests. Smoking not allowed in te house. No experiences yet with Het Kerkje van Etersheim. Be the first! Did you stay in Het Kerkje van Etersheim? Let us know what you thought about it and help others to make the right choice! * I confirm having stayed in Het Kerkje van Etersheim.